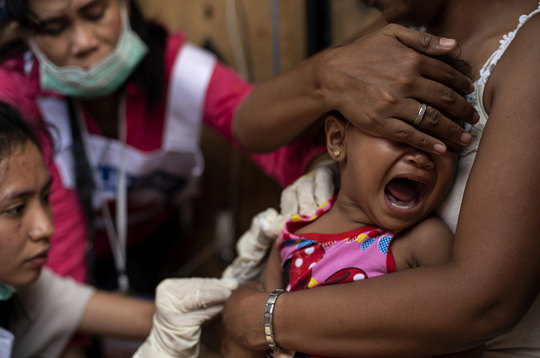 Health Secretary Francisco Duque III on Saturday said measles cases in the country from January 1 to February 13, 2019 had reached almost 7,000, at the same time the National Disaster Risk Reduction Management Council said it wanted the outbreak solved earlier than had been projected. In an interview on Super Radyo dzBB, beamed nationwide, Duque said measles cases in the country had 6,921 in the period covered. Metro Manila had the highest number at 1,752, representing 25 percent of the total cases, Duque said. The metropolis was followed by Region IV-A with 1,653 cases, representing 24 percent of the total cases. Region III follows with 282 cases, representing 14 percent of the total. NDRRMC spokesperson Edgar Posadas said, also in an interview on Super Radyo dzBB, the Council was hoping health authorities could shorten resolution of the outbreak projected at between two and three months. Posadas said the NDRRMC would help the Department of Health in monitoring and surveillance of measles cases. “We were assured by the DOH that everything is manageable. This is what they (health authorities) said, that every three years measles cases rise,” he said. Last week, the Health department declared a measles outbreak in Metro Manila, and other areas in Luzon and Visayas. The outbreak is expected to last until June, according to the Philippine Society for Microbiology and Infectious Diseases. According to Duque, in San Lazaro Hospital, the referral center for infectious diseases, 70 percent of measles patients were from Metro Manila. The remaining patients come from Bulacan, Cavite, and other provinces. He said the DOH was conducting mapping activities, going from house to house to determine which communities have the most number of measles cases and encouraging parents to have their children vaccinated. In Caloocan, there were 190 cases. Manila had 338 cases, while Quezon City had 478 cases, Duque said. Also targetted for immunization are 7 million grade schoolers from kindergarten to Grade 6 who have not yet been vaccinated or have received the measles vaccine but have not had the second dose. He added the immunization program also targetted preschoolers and those outside of the ages mentioned.